Drive your career in a positive direction. Work in our Distribution Center or on the road. Attend a hiring event near you. Walk-in interviews are welcome. Kwik Trip, Inc. benefits are second to none: health and dental, vacation time, profit sharing, bonuses, and more. We are looking for friendly, outgoing people to join our team. Take the lead with a career at Kwik Trip, Inc. Ensure fresh food, hot coffee, and the highest level of store cleanliness for our guests. Join the Kwik Trip family at our Support Center in La Crosse, Wisconsin. Kwik Trip, Inc. has a philosophy of recycle, reduce, and reuse to save time, energy, and natural resources. When you start a career with us, you become a part of the Kwik Trip family. Be part of the production at our state-of-the-art facilities. Now recruiting co-workers for our stores in Iowa and Wisconsin. 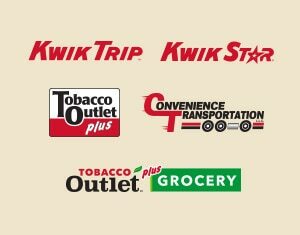 Kwik Trip, Inc. operates as Kwik Trip, Kwik Star, Tobacco Outlet Plus, and Tobacco Outlet Plus Grocery locations in Wisconsin, Minnesota, and Iowa. Since 1965 Kwik Trip, Inc. has operated friendly, clean, trusted, local convenience stores in communities throughout Wisconsin, Minnesota, and Iowa. Not ready to apply for a job, but still interested in working at Kwik Trip? Join our Talent Community to receive specific opportunities that match your career interests and other relevant news.